The labbits are getting to the end of their winter produce share from Deep Meadow Farm. 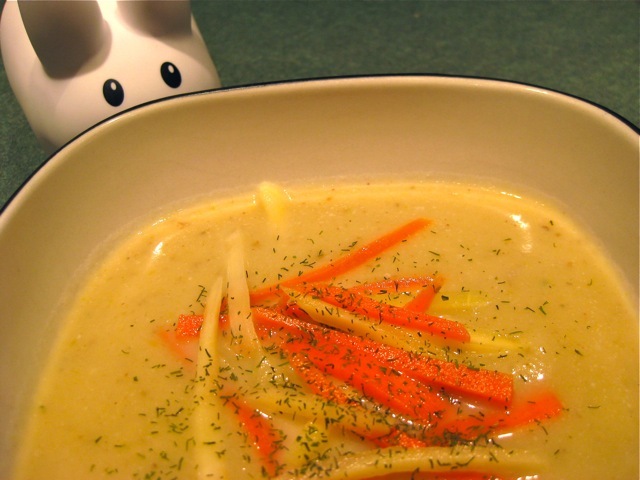 Tonight's dinner was a creamy turnip and potato soup with a garnish of dill and matchstick cut carrots. In the photo below Pipkin is shown with chicken stock but this is even better with veggie stock. 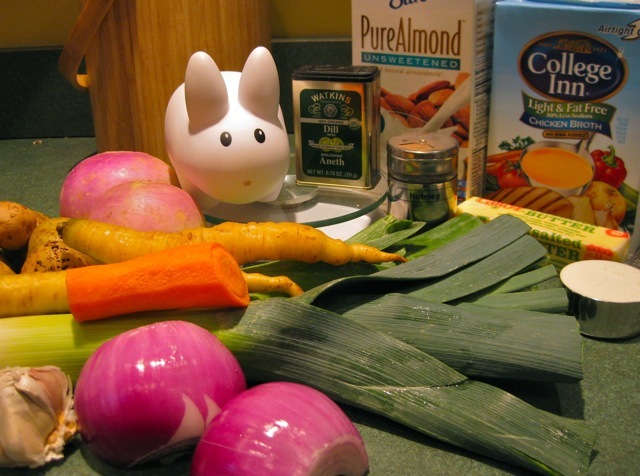 The use of almond milk instead of regular milk gives this soup a smooth nutty flavor. Click here to print out the recipe. Melt butter in heavy large Dutch oven over medium heat. Add leeks and onion and sauté until onion is translucent, about 12 minutes. Add sliced turnips and potato and sauté 2 minutes. Add 5 cups broth. Bring to a boil. Reduce heat to medium-low and simmer until vegetables are very tender, about 30 minutes. Puree soup in a food processor in batches until very smooth. Return to Dutch oven. Add almond milk and heavy cream. Bring to simmer. Season to taste with nutmeg, salt and pepper. Cook carrot strips in a pot of boiling salted water until just crisp-tender, about 2 minutes. Drain. Bring soup to simmer, thinning with more broth if necessary. Ladle into bowls. Garnish with carrot strips, and chopped fresh dill. Recipe: adapted from Bon Appetit magazine. I made this soup tonight and it is delicious!! Thanks Pipkin! Cool! Any variations you did that you liked?